(Nanowerk News) The capacity of a textile implant to be tolerated by the body – known as biotolerance – plays an important role in regenerative medicine. Nevertheless, the body does not always tolerate textile implants. Even modern implants made of resorbable biopolymers, such as polylactic acid, break down in the body after a certain period of time and decompose into individual acidic components. They can then cause considerable problems around the implantation site ranging from inflammations to rejection. That is why biotolerability is a decisive factor in the rapid generation of blood vessels at the implantation site (known as angiogenesis). New capillaries ensure that acidic decomposition products resulting from the breakdown of bioresorbable textile implants can be quickly transported away from the area. At the same time, the new blood supply guarantees that cells involved in building up tissue receive sufficient nutrients and the implant is integrated into the tissue rather than being encapsulated as a foreign body. Textiles colonised with stem cells secrete signalling molecules that stimulate the development of new capillaries from existing blood vessels. The Institute for Hygiene and Biotechnology (IHB) at Hohenstein has long been doing research on how formation of vascular tissue can be stimulated specifically on textile implants. Only recently, a research team made up of doctors and human biologists led by Prof. Dr. Dirk Hoefer showed that specially modified textile fibres are also suited for functioning as a matrix for adult human stem cells on the basis of which new, healthy tissue can be developed. Now the scientists at Hohenstein have successfully carried out a ground-breaking experiment with respect to the tolerability of implants using an animal-free substitute method known as the chorioallantoic membrane assay. Textiles that had been colonised with stem cells were applied onto a chicken egg membrane with a dense network of blood vessels. The dense network of blood vessels of the CAM and its lack of immune competence create optimal conditions for investigation of a functional circulatory system. The scientists aim was to have the implant itself release the growth factors required to stimulate the formation of new blood vessels. The stem cells were to assume this function. The researchers first coated the fibres of the textile implants with specific adhesion molecules, then colonised them with adult human stem cells that are known to release growth factors for new blood vessels. In order to follow precisely the fate of the stem cells, before they were introduced to the implant, the "all-rounders" were genetically modified so that they produced a red, fluorescent pigment that allowed the integration of the stem cells in the surrounding tissue to be visually monitored. In several test series conducted in this way, the researchers observed directed vascularisation within the textile implant microscopically and macroscopically. 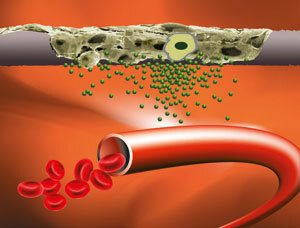 New blood vessels grew within the implant and formed a functional capillary network. If the textiles were colonised with connective tissue cells that did not release growth factors, vascularisation did not occur. The Institute for Hygiene and Biotechnology's new results may be used in future approaches in regenerative medicine. Implants colonised with a patient's stem cells could serve as biologic textile implants (e.g. hernia mesh implants) that can be integrated into the patient’s body more quickly and without rejection in order to regenerate damaged tissues. The system applied at Hohenstein also makes it possible to gain insights into many other aspects of circulation in textile implants and routinely optimise these implants for medical use. This is an important milestone in the further development of textile regenerative medicine. The researchers at Hohenstein intend to publish their results in a specialist scientific journal.